This is just one of the many exhibits celebrating De Stijl throughout the country in 2017. This year marks the one hundredth anniversary of the founding of De Stijl, a Dutch art movement that has had a profound impact on both Dutch design and modern art. The work of Mondriaan and other De Stijl luminaries, such as Gerrit Rietveld and Theo van Doesburg, is showcased in special exhibits around the country, along with works by a broad range of artists and designers whom they have influenced over the past hundred years. From painting to print to packaging, it is hard to escape the impact De Stijl has had on the visual world. World War I, and The Netherlands’ neutrality, played a role in the founding of De Stijl. Because of the neutrality, Dutch citizens were unable to leave the country during the war. Even Mondriaan, who was living in Paris but visiting The Netherlands at the start of the war, found himself unable to return to France. As a result, many Dutch artists began to meet up and exchange ideas. One particular artist – who was also a writer, poet and critic – was Theo van Doesburg, the principal founder of De Stijl. It was in Leiden that he began to gather together various artists and discuss new ideas about art, abstraction, universality, simplicity and more. By 1917, they would produce a journal called De Stijl, laying out their ideas and giving their new movement its name. The initial members of the movement were Van Doesburg, Piet Mondriaan, Bart van der Leck, J.J.P. Oud, the Hungarian artist Vilmos Huszár and poet Anthony Kok. A young Gerrit Rietveld, who worked as both a furniture designer and architect, joined the group in 1918. Over the years, membership would grow to one hundred artists, writers and designers. The manifestos and art philosophies put forward in their De Stijl journal expressed a belief that everything should be distilled down to its most basic form and color, thus the focus should be placed on solely horizontal and vertical lines and primary colors, along with black and white. This simplification ultimately leads to pure abstraction and a sense of universality. Their ideas were not limited solely to art, though. With the social and economic conditions of the time, particularly the devastation of WWI, they also believed that these ideas could be translated into architecture, furnishings, music, urban planning and much more – ultimately with the goal of creating a new, modern, universal society. By the early 1920s, the group was already changing, with new members arriving with new ideas and older members leaving, sometimes in protest of newly introduced ideas. 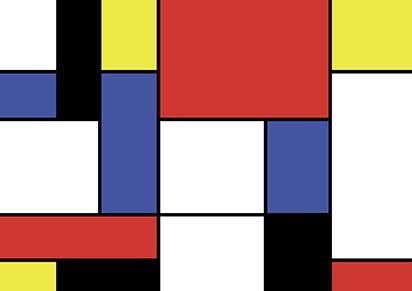 For example, Mondriaan left in 1924 due to a disagreement with Van Doesburg who proposed that a diagonal line was more dynamic than horizontal or vertical lines. However, it was with Van Doesburg’s death in 1931 that the group ultimately fell apart, though it had never been a tight-knit group, as much of the interaction took place via letters. In fact, Mondriaan and Rietveld never even met. While the movement may not have been as united as the universal society of which they dreamed, their ideas did spread beyond The Netherlands and have ultimately continued to be relevant and recognizable. The principles of De Stijl are found in many of the works that were produced by the Bauhaus school, thanks in part to Van Doesburg’s association with the German art school. In addition, Van Doesburg, and particularly Mondriaan, helped cement the acceptance and importance of pure geometric abstract art. Modern art and the International Style, which incorporated everything from industrial architecture to furniture design, developed, in large part, from the ideas originally put forward by De Stijl. The pared-down shapes and colors of De Stijl would go on to influence other modern greats such as Mark Rothko and Frank Stella. Even pop artists like Roy Lichtenstein drew inspiration from the emphasis on primary colors and bold black lines. While Van Doesburg and Mondriaan were influencing modern painting, Gerrit Rietveld was influencing modern architecture. Though only the Rietveld-Schröder House was built specifically following the ideas of De Stijl, many of Rietveld’s other buildings — both commercial and residential — demonstrate elements of the artistic theory. Pure geometric lines and shapes create balance while avoiding symmetry, and they have remained relevant and influential. Rietveld’s work even influenced many of the great 20th century architects, including Mies van der Rohe and designers Charles and Ray Eames (who built the Eames House). De Stijl’s influence did not end in the 20th-century. Even today, elements of the artistic movement have found their way into modern Dutch design as seen in the work of Piet Hein Eek, Hella Jongerius, Maarten Baas and Joris Laarman, to name just a few. This year, in honor of the one hundredth anniversary of the founding of De Stijl, events and exhibits are taking place throughout The Netherlands in cities such as Drachten, Amersfoort, Otterlo, The Hague, Utrecht, Leiden and Eindhoven. And it is not only special events and exhibits that are devoting attention to De Stijl. 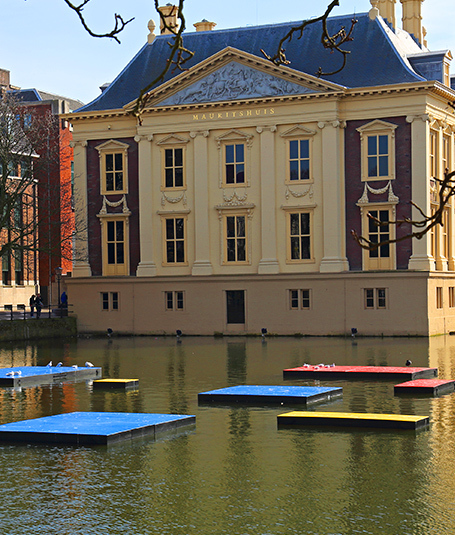 The art movement is popping up everywhere you look, from the buildings throughout The Hague that have taken on the looks of Mondriaan paintings, to the giant, light-up Red and Blue Chairs by Rietveld that can be spotted in locations throughout Utrecht. There was even a Mondriaan-inspired fashion boat at this year’s Utrecht Gay Pride Boat Parade. Everyone has gotten into the spirit. In Leiden, the birthplace of the art movement, Museum De Lakenhal turned the Pieterskerkhof (Peter’s Church Square) in the historic center of Leiden into the Open Air Museum De Lakenhal. 100 Years after De Stijl. This unusual exhibit showcased work by contemporary artists, emphasizing the continuing influence of De Stijl. There is also an exclusive prototype of the Maison d’Artiste originally designed by Theo van Doesburg and Cor van Eesteren. Amersfoort is where Piet Mondriaan was born and raised. Early this year, after extensive renovations, the Mondriaanhuis (Mondriaan House) reopened, filled with a range of special exhibits and collections. As well as the life-size recreation of his Paris studio, there are video installations that show how his work progressed from representative nature scenes to the grid-like paintings for which he is best known. Another room, known as the New York Room, combines audio, visuals and a large light-up cube to learn more about his final years in New York where he continued to create innovative paintings, including what is considered to be his masterpiece, Victory Boogie Woogie. As the birthplace of three of the four primary figures associated with De Stijl, Utrecht is hosting a variety of events throughout the year. The Centraal Museum is home to the largest collection of Rietveld works, including the famous Red and Blue Chair and the Zig Zag Chair. On display are lamps, tables and even toys created by Rietveld along with works by fellow artists Bart van der Leck, Theo van Doesburg and Willem van Leusden. Many of Rietveld’s works can be seen year-round at the museum, even for those who were unable to visit the Rietveld’s Masterpiece: Long Live De Stijl! exhibit. The Centraal Museum also has ownership of the Rietveld-Schröder House (see page **), and special tours of the home can be arranged through the museum year-round. In addition, as part of the centenary celebrations, the Utrecht tourism department has put together bicycle and walking tours that highlight Rietveld’s history in Utrecht, as well as the many buildings he designed or renovated. These tours will remain a part of the city’s tourism options even after the end of 2017. Utrecht is not only focusing on its native son, however. Through the end of the year, the Centraal Museum will also feature an exhibit titled Droog: Discover the Origin of Dutch Design. Droog Design is a collective founded in 1993 to promote modern Dutch design. In the process, Droog has become an internationally known label in its own right, helping spread Dutch design around the world. Perhaps the largest celebration of De Stijl can be found in The Hague. The city’s Gemeente Museum is hosting four different exhibits throughout the year in honor of the artistic movement. The museum also happens to have the largest collection of Mondriaan works and will be displaying all three hundred of them as part of The Discovery of Mondriaan exhibition. This unprecedented display allows visitors to see the dramatic changes throughout the artist’s extensive career. Also on display are letters, personal belongings and additional recreations of his studios in Amsterdam, Paris and New York. From the extensive display of the work of founding member Bart van der Leck at the Kröller-Müller Museum in Otterlo, to the work of contemporary artists on show at the annual Dutch Design Week in Eindhoven, the year 2017 has been filled with traditional and unique expressions of respect and admiration for the artists who developed De Stijl. They wanted to change the world, and while their utopian dream may not have been realized, their work has truly created a lasting impression.